Singapore's National Day is this week (9 August). So I decided to share Singapore's urban transport story - or my slightly unusual take on it. It is a unique city in various ways but its urban transport policies are well worth your attention even if you don't live in Singapore. Why was the bus-only public transport system in an awful state by the early 1970s? 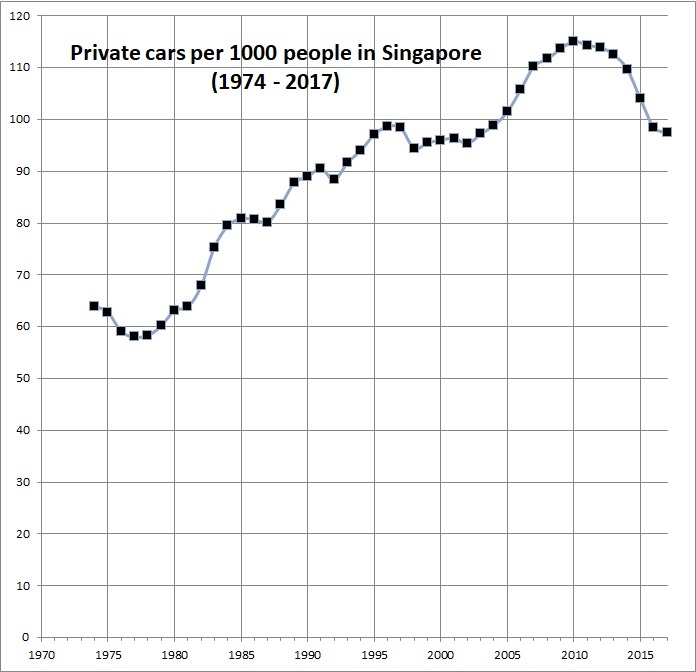 If the buses were awful in early 1974, how was Singapore able to impose drastic increases to the cost of motoring in 1975? You will have guessed that the buses must have been drastically improved in 1974/75. But how was that achieved? 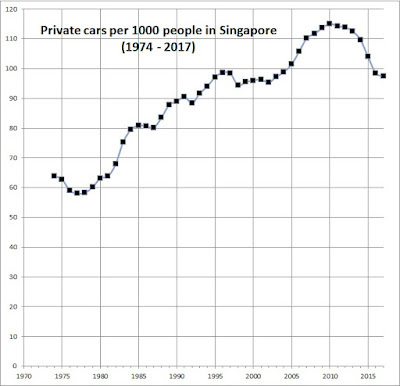 Singapore urban transport enjoyed success through the 1980s and 1990s but its core social bargain (cars for the rich; decent but basic public transport for everyone else) came to seem too elitist in a newly prosperous city. However, the first major effort to fix this backfired badly in the 2000s. Did you know that Singapore's two major policy tools to limit traffic both have demand-responsive prices? Finally, how a new approach, under the slogan 'car-lite Singapore', is seeking a less elitist path forward (ironically despite returning to keeping car-ownership as a luxury). Listen with the player above or SCROLL DOWN TO READ the detailed summary below. Patreon patrons can download a full transcript and a presentation (pdf) with explanations of many of the ideas in this post/episode. With the Youtube version below, you can also listen while watching a slide-show of photos. The big changes of the mid-1970s and what led up to them. Events since about 2002 and recent 'car-lite' initiatives. So, if you only want to read about today's situation, scroll down a few sections. The transport situation by the late 1960s was grim. And similar to rapidly motorizing cities today. Singapore had been successfully industrializing during the 1960's and the new post-colonial government had been focusing on export-oriented industrialization and public housing. But the old master plan was out of date, so rapid development was causing increasing commuting distances. And rising prosperity meant rising vehicle ownership and traffic congestion. There were also serious problems with the bus system. All in all, transport was becoming a crisis. But why was the bus system so bad by the late 1960s? The arrangements for the bus system dated from 1935, the year the British colonial government forced the hundreds of small unregulated 'mosquito bus' businesses to merge into 10 companies. The mosquito buses were much like the unregulated minibuses found in many other countries. They served the city fringes and rural areas beyond the core area, where there were trolley buses. Each of the 10 new companies served a corridor or two under a franchise. As regulated monopolies they had regulated fares. This arrangement worked okay for many years. But by the late 1960s, the bus fleet was aging and huge numbers of buses were off the road in need of repairs. A pirate taxi industry, running shared taxi services along bus corridors, emerged as a symptom of the disease. Most versions of this history point to labour unrest and weak management by small family-run companies. But I think it was a case of fare regulation gone wrong (a common problem for bus systems in low-income and middle-income countries). The 1950s and 1960s were tumultuous politically in Singapore, so governments were not keen to allow bus fares to keep up with costs, as demonstrated by the poor state of the fleet. The increasing traffic congestion and the pirate taxis would have made things even worse. The Singapore government realized it had neglected urban planning and transport planning in the rush to industrialize and build housing. With help from the United Nations, a 'State and City Planning' process led to the 1971 Concept Plan (and trained a generation of Singapore planners). planned a transit-oriented metropolitan spatial strategy. Time to restrict car traffic. But - problem - the buses were still awful! 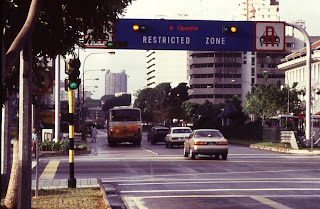 A boundary of Singapore's ALS cordon in 1994 or so. The government quickly made plans to drastically increase vehicle taxes and to introduce the world's first Congestion Charging system (a road-pricing cordon around the city centre, called the Area License Scheme -ALS). People something think that Singapore can be tough on cars because public transport system is excellent. But in the early 1970s, Singapore's buses were terrible and Mass Rapid Transit (MRT) was at least a decade away (and in fact did not open until 1987). And, although political opposition and civil society had been severely weakened in the 1960s, Singapore in the 1970s was authoritarian, not totalitarian. The government faced elections and still had to worry about public opinion. So it was politically risky to act on these plans. Fixing the buses had become urgent! The whole Concept Plan strategy depended on improving them. How did Singapore improve the bus system by 1975? The usual story is that more forced mergers (from ten companies into three in 1970 and then into one in 1973) didn't work. Then, in 1974, the government imposed civil servant managers on the new company, SBS - Singapore Bus Service. The idea is that better management did the trick - together with provision of bus lanes and a significant capital injection to buy new buses and to fix the old ones. This is not a bad short-term explanation. But I think the reason this worked for the long-term too is that it fixed the "fare regulation gone wrong" problem, which I mentioned earlier. With civil servants inside the company, the government could now see the real costs and revenues. They realized the need for a capital injection which achieved quick improvements. And, in the longer run, they saw the need for a more balanced approach to regulating fares. So future fare adjustments were not so harsh. This was ad hoc in 1974 but was gradually formalized in the bus regulatory system. I call the old arrangements a "passive franchises" system, with controlled fares but little attention to system sustainability or service levels. The new system I would describe as a "well-regulated franchises" arrangement, with a more balanced approach to fares and much more attention to service levels. So the bus system was indeed greatly improved by 1975 - just in time for those big vehicle tax hikes and the start of congestion pricing in 1975. AND it was put onto a much more successful institutional footing that did quite well for three decades or so. The policies adopted by 1975 involved a tough-minded social bargain. It involved preventing excessive traffic congestion using some fairly harsh methods. But in return, people who were willing to pay a lot for their car got a pretty good deal, since there was little congestion and gradually improving roads. For everyone else, the government committed to gradually improving public transport. An effective and functional alternative to driving was created. This generally achieved its objectives and Singapore followed this strategy until the early 2000s. The mode share for commuters entering the city centre dropped from 48 percent by car in early 1975 to 29% in late 1975 and 16% by 1983. The share of buses plus rail was about 51% in 1997 for all trips, which is pretty respectable, and taxis were carrying another 12%. Car ownership per thousand people was lower in 1980 than it had been in 1970. In 2002 car ownership was only about 35% of resident households although it rose during that decade as I'll talk about shortly. Urban transport experts and observers from around the world were generally full of praise for Singapore's achievement during the 1970s, 80s and 90s. It wasn't all rosy however. This approach was never popular. It was not unacceptably unpopular either. But there was a growing unease over certain tensions in the approach. Even though the system involved progressive taxation via high costs for motorists, it still seemed elitist to be offering first-class mobility to high-income households and a functional-but-basic alternative to everyone else. And treating cars as a luxury, with high prices, had some unfortunate side-effects. For example, it inadvertently put cars on a higher pedestal as something even more desirable. It also seems to have dampened policy ambitions for the alternatives to cars. MRT became the main focus of efforts to improve alternatives, which is no bad thing. But other alternatives, such as bicycles and even the buses were relatively neglected. This social bargain also seems to have led to a sense that motorists, having paid so much, must be given excellent service. Singapore has a rather dense network of large six-lane arterials with multiple turning lanes and slip lanes at junctions, highway like designs on lots of roads, lots of multi-level junctions - flyovers, underpasses - and a reasonably extensive expressway system. Travel by car is still much faster than by public transport, even in peak hours and even on some of the corridors served by MRT. Let me digress briefly to mention the two main Travel Demand Management (TDM) tools in Singapore. Both have an interesting approach to setting their price levels. In 1998 the congestion pricing cordon was transformed into the electronic road pricing scheme (ERP) and expanded to more locations not just the city center. ERP has the goal of achieving efficient traffic flows. It targets the traffic speeds at which vehicle flows are efficient, which on expressways is about 45 km/h to about 65 km/h. You could say it aims to achieve the efficient amount of congestion! Here is how ERP prices are demand-responsive. The speeds for every 30 minute period near every ERP gantry are monitored and reviewed every three months. If they have been too low then the price at that gantry will be raised. If the speeds have been high - above the target range - then the price can be reduced at that gantry. Reportedly, the main motorist responses to changes in ERP prices are, first, to change the timing of their trips and, second, to change their route. One of the key vehicle taxes that helps keep car ownership levels under control is also demand-responsive. Before 1990, ordinary vehicle taxes set at eye-watering rates were the main approach. 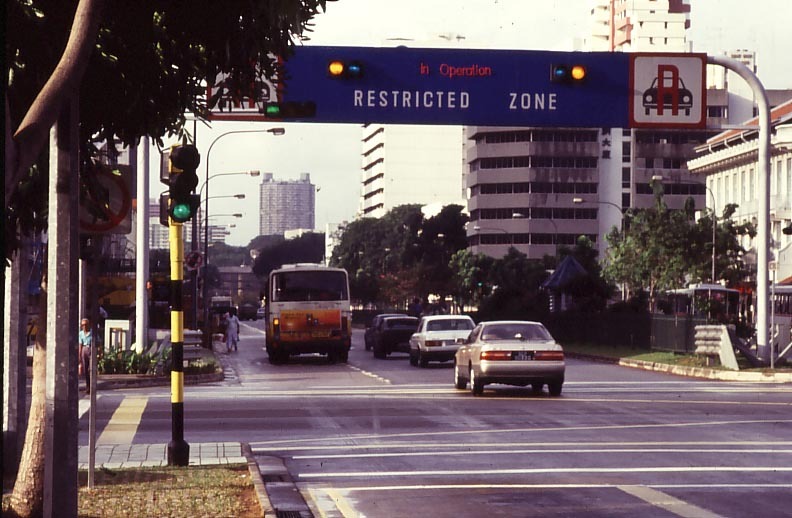 From 1990, Singapore introduced the Vehicle Quota System (VQS). They set a target growth rate for the vehicle fleet of 3% per year. Twice per month there is an auction of rights to register vehicles - they're called Certificates of Entitlement or COEs. So the Singapore government can control the approximate size of the vehicle fleet using something akin to a cap-and-trade approach. Concerns about keeping cars as such a luxury item, and the side-effects of this aging 1970s social bargain, seem to have led to an (unannounced) experiment, starting in about 2002. There was high-level talk of allowing more people to own cars and that it would be better to rely more on the usage-based pricing, such as ERP and parking to keep traffic under control. More people could have cars but they might have to pay more to use them. There was no official announcement of a change to the vehicle fleet growth rate (it stayed at 3%) but quite a few extra COEs were indeed released in the subsequent years. And growth in vehicle numbers was very rapid through 2004 to 2008 - about seven percent on average during those years. Car ownership went from 35% of households in 2002 to 42% by 2012. It might come as a surprise to people outside Singapore, but this was NOT a political success! In fact, it resulted in a lot of unhappiness. As traffic levels rose, ERP prices rose too. Remember, they are demand-responsive. Private-sector parking prices also rose as demand increased. And public sector parking, lacking demand-responsive prices, became overcrowded. By bad luck, fuel prices were also rising through 2003 to 2007. So all those new car owners with modest income levels, who excitedly bought cars in the mid 2000s at prices that seemed cheap (by Singapore stadards), suddenly found it expensive and annoying to actually use their car. They were not pleased. In 2009, Singapore reversed course on what I've called an experiment (which was never really announced as such). The vehicle quota rate growth rate was reduced drastically. First it was reduced from 3.0 to 1.5% and then, in a series of steps, it reached zero percent per year in February 2018. This got a lot of media attention. But, even before reaching zero, the allowed increase in the motor vehicle fleet had been lower than the population growth rate for several years. Clearly, the Singapore government can no longer say that in the future more Singaporeans will be able to have cars and to just be patient. COE prices leapt upwards for a few years, so that even the cheapest cars cost more than S$100K (about US$70K). Prices have eased since then but are still much higher than in the 2000s. Political pressure to improve the alternative to cars reached new heights. So the narrative has changed and, starting in 2014, a new slogan has been prominent: "car lite Singapore". It seems to represent a new determination to make it more of a first-class option to not own a car, so that those who are priced out of owning a car will no longer feel that that's a second-class and fairly functional and basic alternative to this first-class thing of owning a car. But it's a challenge to achieve that. It is trying to chart a less elitist path forward. Ironically, it is doing so while at the same time making car-ownership very much a luxury again. The key imperative here is to try to de-link car ownership from excellent mobility. And this should put Singapore on the front lines of efforts to promote car-free living, Mobility as a Service, and so on. A laid-back regulatory reaction to the arrival of ride-hailing industry (Uber and Grab initially, although Uber has now departed) and, more recently, dockless bike share. These are in line with the Car-Lite thrust. However, new regulation of dockless bike share has apparently led to two companies departing, so we will need to watch this space. Ambitious expansion of the Mass Rapid Transit (MRT) is ongoing. Rail reliability problems haven't helped but a major effort is underway to address these. There is still a surprising amount of road investment and expansion but there may also be signs of change. For example, the North-South Expressway, which was announced in the 2000s, will now become the North-South Corridor, with fewer mixed traffic lanes and with bus lanes and bicycle paths. Singapore's government is enthusiastic about automated vehicles with an emphasis on public transport and "robo-cabs" or "taxi-bots" as applications. If anywhere can achieve a 'shared mobility' AV scenario it is Singapore, since it already has robust tools of transport demand management, like ERP. Relevant here is that ERP in Singapore will soon be turned into a positioning-based congestion pricing system where potentially any kilometer of driving could have a (demand-responsive) price. A newly positive attitude towards bicycles as a serious mode of transport, after decades of neglect. Singapore has not been building world-class bicycle infrastructure but it is trying hard to improve. The Land Transport Authority now has a significant Active Mobility Unit. The regulatory approach to buses has been changed again, to an approach similar to London or Stockholm with government planning of routes that are then contracted out. This gives the government more power than before to improve the bus system. However, it has not yet used this power to reorganize the bus routes. I think it should, since Singapore has a rather tangled web of bus routes with much duplication and mostly lower frequencies than needed in a wealthy and transit-oriented metropolis. There are several new experiments with car-lite urban planning - both in the public housing and in private sector. Parking policy is under review. The Land Transport Authority also now has the power to impose parking maximums rather than just minimums. It also has the discretion to try new approaches to parking provision in the new car lite areas, such as planning parking as a district level rather than for each building. I hope you've enjoyed this rapid retelling of the Singapore Land Transport story. And I hope it was of use to you somehow. Do you have a comment? Post it below! Please do share this article and episode with any of your friends or colleagues who could benefit. Consider becoming a Patreon patron of my efforts here. Patrons have access to a presentation (pdf) on Singapore's Transport Story. Listen with the player above or subscribe to the podcast with your favorite podcast player (click on the wifi symbol) or read the detailed summary below. I decided not to provide citations in this post. The narrative here is based in part on my previous writings on Singapore (search this site for examples) and also on parts of a new book chapter I am writing for an edited collection. The chapter (and my earlier writings) have references of course. I will update this post with a link to the new book when it is published in 2019.